Brian Weaver is best described as an Independent Musician, focused in the disciplines of instruction, composition, and performance. Currently, Brian works as a Music Instructor (Guitar, Mandolin, and Ukulele) for the Community Arts Program at Seton Hill University in Greensburg, PA. He was recruited by its director, Michelle Walters in 2012, upon the recommendation of John Marcinizyn, to teach Guitar lessons. Brian’s primary instrument is Guitar, both Acoustic (steel-string and nylon-string) and Electric. However, he also provides lessons on Mandolin and Ukulele. Brian comes from a long line of artists, musicians, and teachers and is proud to do work that he loves with people he respects. He holds a B.M. in Music Therapy from Seton Hill University (Greensburg, PA), received in 2017. In the proceeding years, Brian plans to also utilize his B.M. in Music Therapy by becoming a Board Certified Music Therapist and practicing in the local and surrounding areas of Western Pennsylvania. While studying at Seton Hill University, he was active in the various ensembles, including the Guitar Ensemble, Jazz Combo, Chamber Choir, and University Choir, as well as several clubs, the Music Therapy Club (Treasurer, 2011) and the Open Mic Night Club. As a student, Brian received Guitar lessons from John Marcinizyn Ph.D., Piano lessons from Edward Kuhn, Voice lessons from Marc Tourre, and Hand Percussion and Drum Set lessons from R.J. Heid. As a result, he successfully passed proficiency in the following instruments: Guitar, Piano, Voice, and Hand Percussion. Beyond degree requirements, he also took Composition lessons from John Marcinizyn. 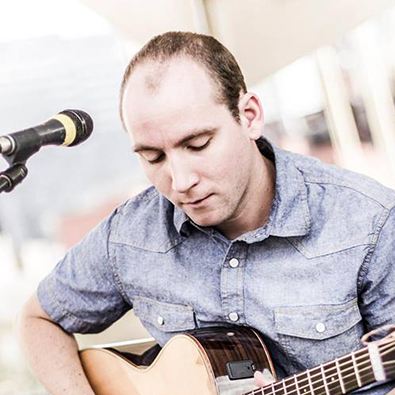 Prior to attending Seton Hill University, Brian studied Music Performance at Belmont University in Nashville, TN, where his principal instrument was Guitar and focus was Composition. While studying at Belmont University, he was active in the Guitar Ensemble and University Choir, as well as received Guitar lessons from John Pell, Robert Thompson, and Jefferson Rogers, and Composition lessons from Bryan Clark Ph.D. As a result of such extensive training throughout the course of his education and continued learning and experience gained outside the classroom, Brian has become a well-rounded Musician capable of teaching students of all ages and experience.